Joe was a car guy pretty much from the day he was born. His Dad and uncles all had neat cars and hot rods growing up so Joe was fascinated with them as a small child. He has vivid memories of riding in uncle Tim’s t-bucket, his ’34 sedan and his uncle Jon’s ’67 Camaro SS. When he was just 8 years old, Joe spotted the most beautiful car he had ever seen while with his Dad at the local upstate NY Gulf station near where he lived. Joe asked his Dad “…what kind of car is that?” His Dad replied “That is a 1957 Chevy son.” Right then and there Joe told his Dad that he would own one some day. With the help of his Dad, Joe bought his first ’57 Chevy when he was just 14. 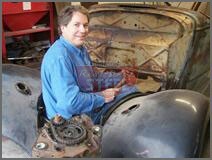 He restored and re-restored that car many times and learned everything from body and paint to engine and interior work all on that one car. Joe has lived and breathed classic Chevy’s ever since. Though he has owned, built, restored and hot rodded many cars, he is deep down a Chevy guy. Joe worked for Classic Chevy International (now Eckler’s Classic Chevy) for 21 years. He began in the tech shop writing tech articles and developing new products. He eventually took over and ran the Classic Chevy show and convention program for over 15 years and was also editor of the magazine Classic Chevy World (now Chevy Classics) for 15 years. With the help of his Dad, Joe bought his first ’57 Chevy when he was just 14. He loves to restore and collect anything vintage with wheels - but his true passion is 1955-57 Chevys. Randy grew up in New Jersey and was that kid that either knew how everything worked and could fix it or if he didn’t, he’d take it apart and put it back together again just to see how it worked. As a young man, he remembers a guy at the end of his street nicknames “Mag” that was the neighborhood car guy. Mag had all kinds of hot rods and hung with the other guys that had the fast cars, so naturally, even as a kid, Randy wanted to hang with them. Randy grew up with mini-bikes, go carts and many things motorized. His first car was his Dad’s hand-me-down ’62 T-Bird. After that was a string of Ford Pintos some were V8 powered and eventually, Randy discovered Chevrolet with his 1968 Nova. The Chevy bug hit hard and Randy soon purchased an original 1969 Camaro Z28 which eventually became an all-out street race car with a best time of 8.80 at 142 mph powered by a carbureted big block Chevy. Randy discovered Chevrolet with his 1968 Nova. He currently owns a 1966 Chevy II straight axle hardtop, a 1967 Chevy II blown big block street car, a 1993 Harley Fatboy custom, a 1929 Ford Model A Tudor sedan hot rod and a tube chassis 1968 ‘glass Camaro door slammer race car. He is one of the few people you will ever meet that has had a car featured in Car Craft magazine and then years later had a different car on the cover of Car Craft. Randy is a master fabricator and engineer and prides himself in doing it all himself. Randy worked for Classic Chevy International (now Eckler’s Classic Chevy) as their tech director, head of R and D and was part of the CCI road show program for over 17 years. He is responsible for hundreds of major technical articles and new products, particularly for the 1955-57 Chevrolet’s. His current pride and joy is a vintage gasser-style 1966 Chevy II.